Note: RTOs are regional transmission organizations. Spending on infrastructure to deliver power to homes and businesses has increased steadily over the past 10 years as utilities build, upgrade, and replace station equipment, poles, fixtures, and overhead lines and devices. Based on information compiled from utility reports to the Federal Energy Regulatory Commission (FERC)—filed by utilities representing about 70% of total U.S. electric load—those utilities spent about $21 billion on capital additions in 2016. The Edison Electric Institute (EEI) estimates that utility spending on transmission infrastructure continued to increase in 2017. Investment in transmission additions accounted for most utility transmission expenditures. In 2016, total transmission expenditures by utilities included in the FERC data reached $35 billion, with investment in transmission infrastructure making up 61% of that total. Operational and maintenance costs—such as payments to transmit electricity over different power lines and the cost of maintaining overhead power lines—made up most of the remaining transmission expenditures. 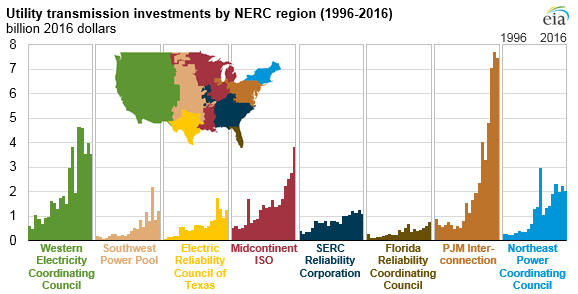 Spending on operations and maintenance of the transmission grid has also risen steadily—from $3.3 billion in 1996 to $13.5 billion in 2016—by the companies included in the FERC data. Spending to build, operate, and maintain regional transmission organization and markets made up 1% of that utility transmission spending. The Midcontinent Independent System Operator’s (MISO) Multi-Value Portfolio is a $6.6 billion portfolio of 17 transmission projects designed to address regional reliability needs and provide greater access to renewable energy resources (mainly wind and Canadian hydro) across the MISO footprint. Of these projects, five are complete and nine are under construction, as the others await state regulatory approval. Energy Gateway is a $6 billion major transmission expansion program that will add approximately 2,000 miles of new transmission lines within the Western Electricity Coordinating Council to more reliably meet new demand patterns, strengthen utility connections, and provide greater access to new wind, solar, geothermal, and other resources. At the end of 2017, 405 miles of new transmission lines had been added with completion dates planned through 2024. Energizing the Future is a program to replace aging equipment in the PJM Interconnection region with advanced smart grid technologies designed to enhance system reliability by preventing or quickly identifying outage locations, meeting expected load growth from shale gas activity, and reinforcing the current system in light of coal plant closures. After an initial $4.2 billion investment from 2014 through 2017, FirstEnergy expects to invest another $4.2 billion to $5.8 billion through 2021. Oncor, located in the Electric Reliability Council of Texas (ERCOT), is planning to spend $1.2 billion to upgrade aging infrastructure and build new lines to accommodate large increases in electricity use associated with oil and natural gas extraction in the Permian Basin.